This year, the sweet mandarins came in stores really early here in Norway. I think I have eaten these orange delights throughout November and parts of October as well. Tired of them now? Of course not! Do you want to turn these sweet fruits into macarons? Here’s a suggestion how to: make a mandarin curd! 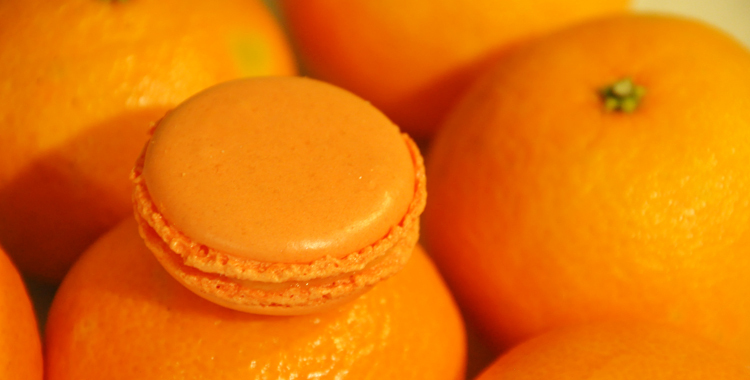 Compared to other Christmas cookies, these macarons is a fresh experience, with a distinct and rich citrus flavor. Follow the base recipe making the macarons. Add the mandarin zest and some concentrated orange food coloring to the mixture, while beating the egg whites. Bake and cool the macarons. Mix all the ingredients in a small saucepan, except for the butter. Cook over low heat until the mixture thickens, constantly stirring. Remove the saucepan from the heat, allow to cool a bit, and then stir in the butter. Whisk well. Place the macarons on a serving platter, serve them and enjoy! Happy holidays!